Here on Geeky Gadgets we have featured many small drones and quadcopters but one company E-Volo is looking to take multi-rotor flight to the next level and has this week revealed details of the first flight of an 18 rotor electric helicopter. The E-Volo Volocopter electric helicopter is capable of carrying two people and is fitted with enough power to hit a top speed of 60 mph, check out the videos below to learn more about the design and construction of the electric helicopter that has been created to revolutionise urban mobility. 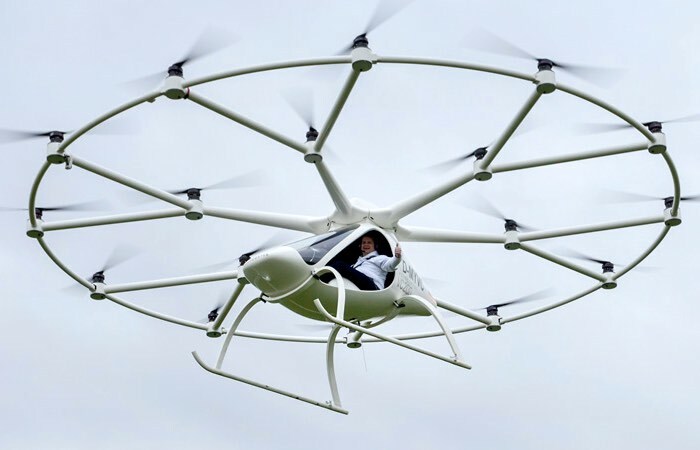 The manned flight of the world’s only approved Multicopters, the Volocopter VC200, heralds the beginning of a new era in the advancement of the human race. Even flying air taxis to entire transport networks in the third dimension are moved with Now that the validation of this technology within reach. For more information on the new E-Volo Volocopter electric helicopter jump over to the official website for details via the link below.